Good morning! Situational awareness: The White House has completed reviewing EPA's plan to scale-back Obama-era auto mileage and CO2 rules, the Office of Management and Budget website shows. That's a sign that the controversial proposal could surface very soon. And look for the topic to come up when acting EPA Administrator Andrew Wheeler appears today before a Senate committee. Tesla will report its second quarter earnings after markets close late this afternoon, followed by co-founder and CEO Elon Musk's call with analysts. Why it matters: There are lots of reasons to look closely at the company's health right now. The growth in electric vehicle deployment in the U.S. still can't be untethered from the future of Tesla. Yes, the company has stumbled lately, but has done more than any other to make EVs cool. Tesla is under an intense glare, thanks in part to Musk's vow that the company will be profitable during the second half of this year. The company posted a $710 million loss last quarter, its worst ever, so the April–June financials are an important milestone. The big picture: This is a high-stakes moment for the company, but expectations will be even higher in three months, thanks to Musk's forecast about turning a profit. 1. Earnings report: Of course, we'll check whether the losses are better or worse than forecasts. According to Zacks, revenues are expected to hit $3.79 billion with losses of $2.71 per share..
2. Model 3 status. Tesla achieved its goal of making 5,000 per week at the very end of last quarter. Analysts will be looking for info on production since then and whether it's sustainable. In early July, the company said it planned to be producing 6,000 Model 3s per week by the end of August. A related topic is how and when the company will roll out the long-promised $35,000 base model of the car. What's available now is far more expensive. 3. Expansion plans: The Wall Street Journal reported this week that officials in Germany and the Netherlands reached out to Tesla about building its first European factory there. Analysts may also seek more information on plans announced July 10 for a Chinese factory. Of note: More details on Tesla's China plans emerged Wednesday via Bloomberg. 4. Tone: Musk's behavior has been erratic in recent months, most notably accusing a British cave diver involved in the rescue of trapped boys in Thailand of being a "pedo guy." Musk later apologized. How many cars are in holding lots and how many of those have firm customer orders. What does Tesla's board think of Musk's aggressive Twitter habits. How Tesla is staffing the Model 3 ramp up and accounting for those personnel. How Tesla will finance its European and Chinese factory plans. Axios' Amy Harder reports ... The Trump administration is preparing to take a two-pronged approach to rolling back regulations cutting methane emissions from oil and gas wells, Axios has learned. Why it matters: Methane is a potent greenhouse gas that's purposefully or inadvertently leaked in the production and transport of the fuel. The Environmental Protection Agency has been slow in its approach to rolling back Obama-era rules addressing methane. The details: The plans, as articulated by an administration official and corroborated by others tracking the topic, signal that EPA is inclined to pursue a more aggressive rollback instead of a replacement approach. 1. EPA is planning to soon issue a smaller, more technical rulemaking that environmentalists say will weaken the Obama-era rule currently on the books, which affects new oil and gas wells only. 2. The agency is set to later propose a broader draft rule that includes a range of regulatory options but likely contains a preference for wholly rolling back direct rules on methane and instead relying on a separate air pollution rule issued in 2012. This targets other air pollutants but has the effect of cutting methane too, according to Obama’s EPA at the time. What they're saying: In addition to those indirect cuts from the 2012 rule, an administration official also said the oil and gas industry has increased its voluntary efforts in this space, indicating a direct regulation may not be necessary. 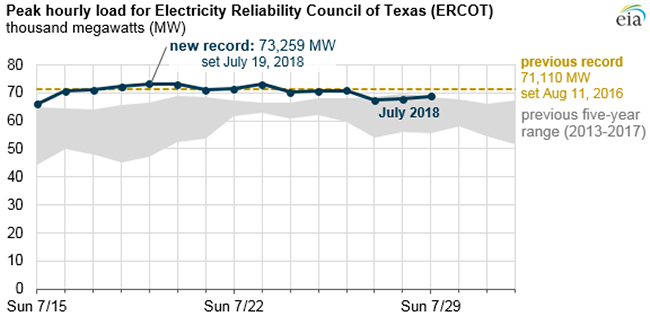 The Energy Information Administration chart above — pulled from this short report — is a nice visualization of the record-setting demand on the Texas power grid last month. The Texas grid is an energy-only market, which, unlike capacity markets, pays power plants only when they produce energy. This summer has been seen as a make-or-break test for this market strategy, and so far it is passing. A new post at UPenn's Kleinman Center for Energy Policy breaks down the deal between the White House and European Commission President Jean-Claude Juncker that's aimed at bolstering U.S. LNG exports to Europe. Why it matters: Trump in recent weeks has talked up the possibility of expanding gas shipments to Europe, but a number of analysts have cautioned that Europe is unlikely to absorb huge amounts of U.S. LNG. Strategically placed ... new terminals could impact Russian pipeline gas deliveries — if not in volume, then at least in price — while dulling the geopolitical benefits Russia is deriving from its dominant supplier position. Air pollution concentration averages. Screenshot from EPA's "Our Nation's Air" trends report. EPA released data Tuesday showing steep reductions in a suite of air pollutants — including emissions from power plants and vehicles — between 1990 and 2017, a period in which the economy got far larger. 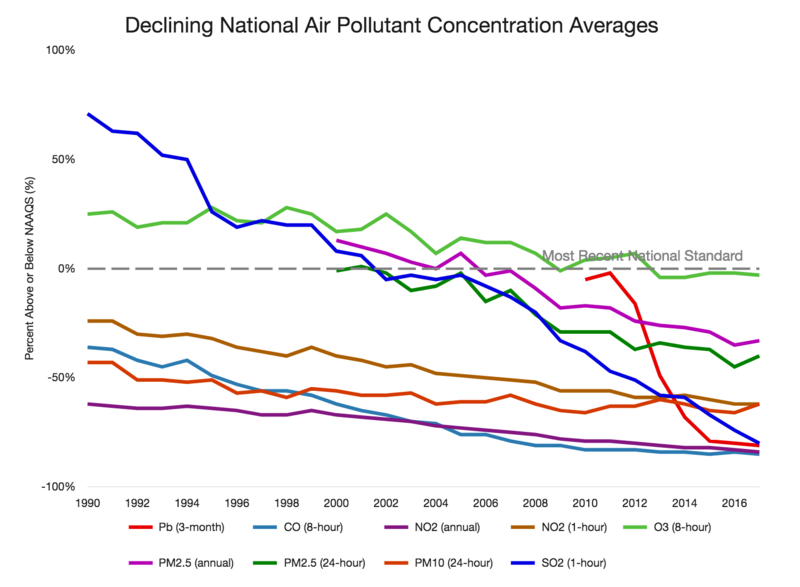 Why it matters: The report highlights major improvements in U.S. air quality in recent decades, but arrives as critics of the Trump administration say that relaxing Obama-era air pollution rules threatens those gains. Fine particulate matter pollution has fallen by 40%. Sulfur dioxide has dropped by 88%. Nitrogen dioxides have been cut in half. Carbon monoxide is down 77%. What they're saying: “Through federal and state implementation of the Clean Air Act and technological advances in the private sector, America has achieved one of the great public-private successes of our time — dramatically improving air quality and public health while simultaneously growing the nation’s population and economy,” Wheeler said in a statement. Yes, but: The Environmental Defense Fund's Jeremy Symons said Trump administration moves to scale-back various Clean Air Act mandates will reverse that progress, per Bloomberg. “If polluter lobbyists had gotten their way for the past 40 years like they do under Trump, we wouldn’t have the clean air today that has improved the health and lives of millions of Americans," he said. The intrigue: Bill Wehrum, EPA's top air quality official, said yesterday that the recent increase in particulate matter stems from western wildfires, according to multiple press accounts. State of the market: Per Reuters, "Oil slipped below $74 a barrel on Wednesday, pressured by an industry report that U.S. stockpiles of crude rose unexpectedly and by higher OPEC production, adding to indications of more ample supply." Electric cars: BMW is building a new factory in Hungary that can "manufacture up to 150,000 conventional and electric cars a year on a single production line," the Associated Press reports. Batteries: Via Utility Dive, "[M]arkets for EV and stationary storage batteries are beginning to diverge, which could result in separate cost trajectories and changes in their respective supply chains." Earnings: Per the Wall Street Journal, "Volkswagen AG took another big earnings hit Wednesday from its diesel-emissions crisis and warned that new testing standards pose a further risk for the world’s largest car maker." Axios' Dan Primack reports ... Bloom Energy founder and CEO KR Sridhar gave an interview to MarketWatch after the fuel cell maker's IPO last week, in which he falsely claimed "the company is already profitable as of the second quarter," made similar claims about year-end expectations, and then made unauthorized statements about existing shareholder sales.